Renegade rows train anti-extension. When you hold proper position without arching your back or pointing your glutes, you’ll work your anterior core to build strength and endurance. Strength combined with the ability to prevent movement when fatigued, is the key to preventing injuries. They train anti-rotation. Rotational power is important for athletes, but to build powerful rotation you must first be able to prevent it. With each rep on the renegade row, you’ll need to row slowly while pushing both hands and feet into the ground to prevent movement. They hammer your chest, triceps, and shoulders. 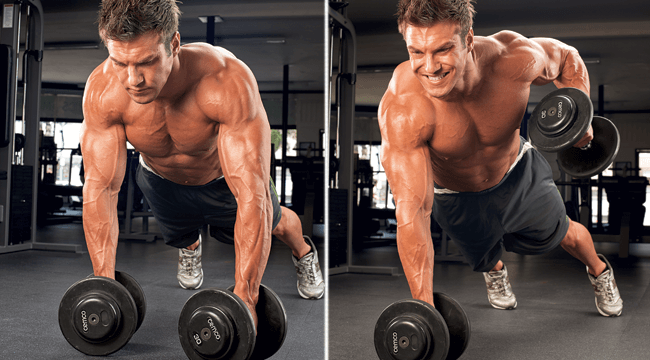 Your hands are elevated on dumbbells, leading to a deeper push-up. A deeper range of motion means a greater stretch of your muscles, leading to a greater concentric contraction. During each row, you’ll need to push the non-rowing dumbbell into the ground. This creates a strong isometric contraction of your chest, shoulders, and triceps. Each set of renegade rows takes 30-60 seconds. Evidence points to time under tension (TUT) being a primary driver for metabolic stress-induced hypertrophy. When done for many sets, the cumulative time under load cooks your upper body and makes for an excellent high-performance finisher. They train your lats. You’ll need to row the dumbbell back towards your hip in a “J” pattern. When rowing in this fashion, the lats are the primary focus rather than the traps, rhomboids, and rear delts. Further, your push-up is deeper due to elevating your hands on dumbbells. This hits your lats harder (as well as your chest) as they work overtime to stabilise your shoulders. If you’re not accustomed to deep push-ups, this exercise will create soreness in your lower lats. They integrate strength and stability. Your core prevents unnecessary movement and the renegade row strengthens that ability. This protects internal structures, like your spine, from folding like an accordion and setting you up for months of physical therapy.